Denim pieces are clothing items that are commonly found in most closets. And the craze of mixing denim on denim is a trend that has been around a while and continues to not go out of style. When a trend has been circulating around for some time, it is important to modernize the look by adding more up-to-date trends. 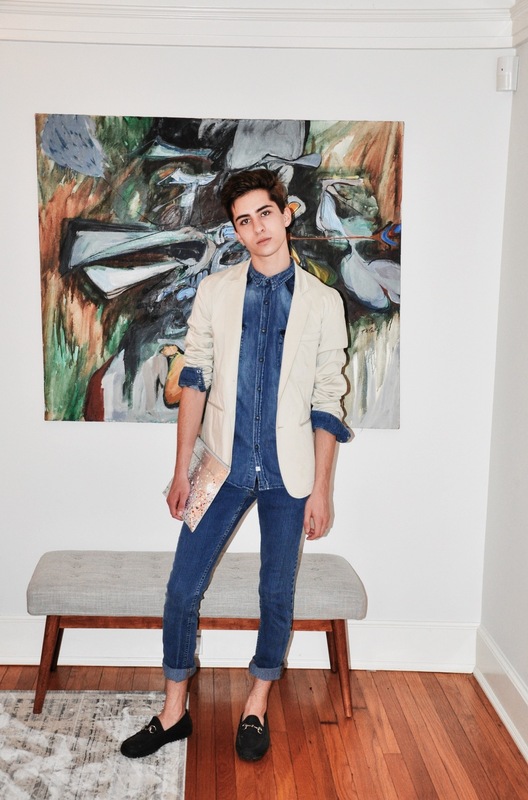 My denim blend consists of key modern-man essentials, such as a blazer, leather clutch, and loafers. To start off in this look, I used pretty basic and slimming denim pieces from Zara. I kept it all slim-fit to create a look that has a truly modern feel. I paired the look with a neutral blazer that follows this summer's palate completely. My shoes are rubber horse-bit Gucci loafers. They are one of my most comfortable and sensible shoes, which makes it the best of both worlds since they happen to be from Gucci. This pair of loafers is great for literally any occasion due to the fact that they are composed of 100% rubber! 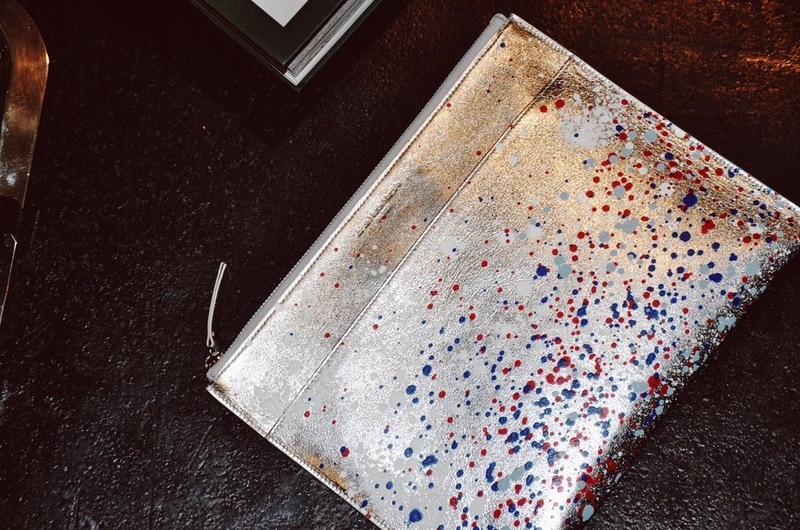 And, of course, my silver paint splattered clutch from Maison Martin Margiela. This piece is simple, chic, and a total statement. I got it from Barneys New York in the winter, however this Maison Martin couture is one of my favorite brands and they have fantastically one-of-a-kind pieces out right now. 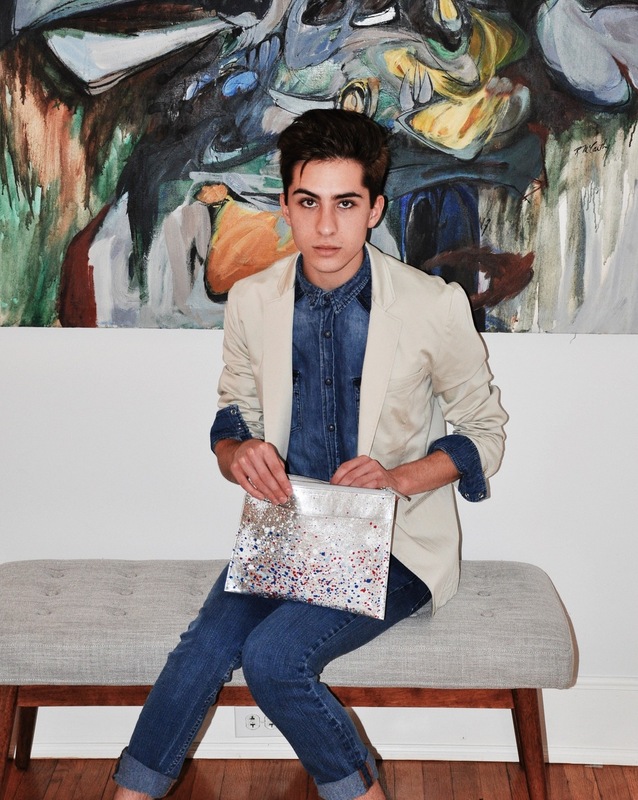 But, I loved how this leather clutch tied the whole look together with the blue paint splatters. Oh! This painting behind me is by one of my favorite artists, Rita Rogers. Stay tuned for a feature on her work in the near future.